Women are made fragile and soft by nature, they are always considered as smart and sensitive beings with delicate features and slim physique, they can never be thought as body builders, but with the progress in the field of body building and personal training, women have also jumped into the field of body building and earned a good name in muscle growth and weight lifting, as weight lifting is a hard job, women have proved themselves to be a strong being by embarking this field as well. 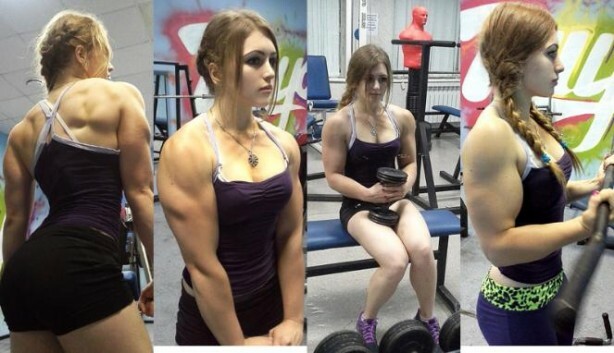 Normally, female power lifters and body builder are rough and tough and because of involvement in a job related to males, they turn themselves into man like women by their body and face even, but here is a unique example of a Russian girl, who is a weight lifter but her face is so innocent and beautiful that she looks like a very delicate artificial doll. The Russian girl has surprised everyone with has contrasting innocent doll like face and her built up body, seeing her is believing her, otherwise people may think about her pictures as fake and photoshopped.